EZ Creations brings you an assortment of the finest quality and beauty in cat jewelry. Delicate designs and superb quality. 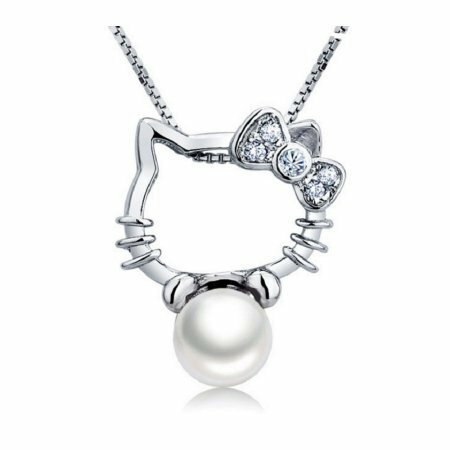 All our cat jewelry is made of 925 Sterling Silver. A rhodium finish is applied to ensure there is no tarnish and allergy free, nickel free, and tarnish free. This above design is enhanced with an 8.0mm created freshwater pearl. Bow has pave set CZ. Available in white or red, with beautiful sparkling luster. All EZ Creations jewelry is shipped with a free polishing cloth to keep your jewelry sparkling at all times. A suede drawstring pouch is also included. Finished charm measures 5/8" across, by 3/4" long. Chain is adjustable 16"-18". ACCESSORIES: Sterling Silver chain has 2" extension which is adjustable for 16" to 18" Closes with a Lobster spring lock, which is easy to grip for opening and closing. PACKAGING: Shipped in a velvet drawstring pouch, a polishing cloth included. Ready to present as a gift. ALLERGY FREE: What you see is what you get! You'll be proud to own an affordable luxury piece of jewelry. Go in style. This cat necklace is nickel free and lead free, anti-allergy. FRESHWATER PEARL: All Freshwater Pearls are directly imported from the pearl farms of China. Our pearls represent the finest in pearl selection, hand picked for its luster, quality, color, and cleanliness. If you have any questions about this product by EZ Creations, contact us by completing and submitting the form below. If you are looking for a specif part number, please include it with your message.